the red sun rising in your life. you drew a picture of your essence. became a mirror for you. were for you your entire universe. and became your bride in red. and I began to love redness. Red! Red! Red was my good fortune. I embraced the blood-like red. of the beauty of blood. you sent to me as your wedding gift. welcomed it and followed it. these footsteps have reached their end. I ask for a red revolution. Rashmi Rajya Laxmi Shah, daughter of renowned poet and artist Balkrishna Sama, was a full collaborator along with her husband Jagat Prakash Jung Shah to the anti-Rana democratic movement led by the Nepali Congress. After Jagat Shah was killed in action during a revolt against King Mahendra’s government in 1962, Rashmi Rajya stayed in Calcutta as refugee. Son Naveen Prakash Jung Shah recalls that it was only after the death of her husband that she fully adopted the red insignias of a married woman. The poem above was written sometime before she committed suicide a day before Teej of the same year. Nuwakot, c.1950. 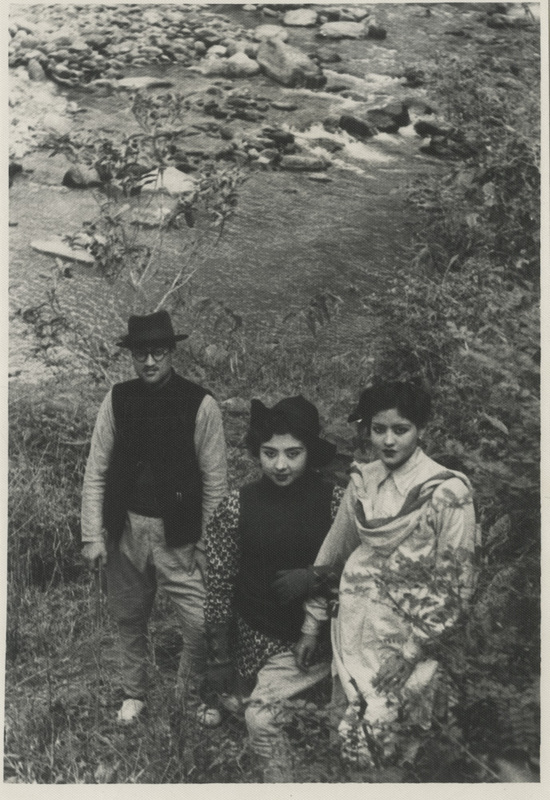 Rashmi Rajya (middle) seen with her husband Jagat Prakash Jung Shah (left) during one of their many visits to Nuwakot, where the family held feudal rights and where the couple were subsequently canvassing for Jagat Shah’s nomination during the democratic legislative election of 1959.